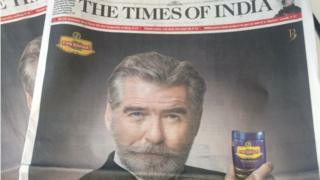 Image caption The company responsible says the outrage was due to a "public misconception"
Brosnan caused a stir in India when he appeared in an ad for Pan Bahar, a product many associate with a highly addictive form of chewing tobacco. He told People magazine he was "distressed" by the row. He has asked Ashok & Co, the company that produces Pan Bahar, to remove his image from all their advertising. Many have associated Pan Bahar with pan masala and gutka, a potent mixture of tobacco, crushed betel nut, lime, and clove among other ingredients. It is chewed and then spat out in bright red streams by millions of people, who get addicted to its mildly psychotropic effects. Both pan masala and gutka have been linked to cancer, with many Indian states banning their sale and running campaigns to discourage people from buying them. Representatives from Ashok & Co. were not available for comment, and their website displays a sign saying it is "under maintenance". However, speaking to the BBC when the advert first appeared, the company said the outrage was the result of "public misconception", adding that there was no tobacco or nicotine in the product. However, such clarifications did little to quell social media anger at the time, with many accusing Brosnan of "promoting cancer" in endorsing Pan Bahar. Brosnan said that the company had "manipulated" media agencies into thinking he was an ambassador for the product and apologised to anyone he may have offended. "Having endured, in my own personal life, the loss of my first wife and daughter as well as numerous friends to cancer, I am fully committed to supporting women's healthcare and research programs that improve human health and alleviate suffering," his statement said. There has been some social reaction to Brosnan's statement, but nowhere near the levels as when the advert first appeared.